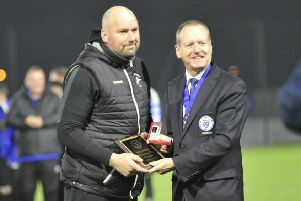 Little Common player-manager Russell Eldridge hailed ‘a great achievement’ after the football club clinched promotion with six games to spare. The Commoners made sure of a top three finish in Macron Store Southern Combination League Division One with a 2-0 victory at home to fourth-placed Wick last weekend. Adam Smith brings the ball under control during the promotion-clinching 2-0 victory at home to Wick. Eldridge said: “To achieve promotion with six games to go is a great achievement and fully deserved. Teams will say we’re not the best team we’ve played against, but we’ve scored goals, we’ve defended well and every time we’ve had a setback we’ve responded. This will be the third time in six years that Common have finished in a promotion position. Ground grading issues have prevented them from going up on the previous two occasions (in 2013 and 2017), but they won’t be denied this time. Common have extended their groundshare arrangement with Premier Division side Eastbourne United AFC for next season so they will play step five football for the first time in their history during the 2018/19 campaign. “We owe a great deal of gratitude towards Eastbourne United,” continued Eldridge. “They helped us out at a time when we needed it (Common had to leave their own ground at Little Common Rec after last season as it didn’t meet the grading criteria for Division One) and they’ve been absolutely fantastic in the way they’ve accommodated us. Eldridge dedicated the success to his late grandfather Ken Cherry, who founded the club in 1966 and was still chairman when he died in January 2016, aged 81. With promotion achieved, table-topping Common - who are 10 points clear of second-placed Langney Wanderers having played an extra game - require 12 more points from the remaining 18 available to be crowned champions. They’ve won 24 and drawn one of their 28 league fixtures so far, scoring 93 goals and conceding 26 (the division’s fewest) for a superb league-best goal difference of +67. “Over a period of time we’ve been very good, but the job isn’t done yet,” added Eldridge. “There were muted celebrations (at the final whistle on Saturday) because there’s still more to do. “There’s six games to go. We’ve done magnificently to this stage of the season and we want to continue in the way we’ve played for the vast majority of the season. Common’s next two league games are against sides in the bottom three, but they still have to play three of the top five, including Langney and local rivals Bexhill United. Little Common’s remaining league fixtures: March 24 Oakwood (a), March 31 Billingshurst (h), April 2 Bexhill United (a), April 7 Seaford Town (a), April 14 Lingfield (h), April 21 Langney Wanderers (a).